Under the Surf (Surf Movie) Premiere Terry Lilley’s latest film, Under the Surf (Surf Movie), premiered on the big-screen yesterday at theVenue, a small indie theater/bar in Honolulu. The house was packed including luminaries from both the scientific and surfing communities. A lively discussion on the myriad issues facing Hawaii’s coral reefs followed. Hanalei Bay Surf Big winter surf at Hanalei Bay! These images are available as mounted and framed prints as well as a variety of print-on-demand products from Zazzle. This video from Pipeline in Feb. 2012 was the best body boarding I have ever seen! I am doing an underwater video series about the reefs and marine life at our favorite surf spots called “Under The Surf, Surf Movie”. This short video is a one of a kind! Each surf reef has its own ecosystem under the waves and these reefs are rarely documented until now. I use a small HD video camera to video the reefs at Pipeline, Wiamea Sunset Beach and other surf spots in Oahu and Kauai. Hi Ocean Lovers, Check out this Pipeline footage I shot two weeks ago of the best body board contest ever, along with some fun music! I was in Oahu shooting my next video all about the reefs under the famous surf spots for my next video, called “Under The Surf, Surf Movie”. January surf pics out of my HD video at Hanalei. The pics and videos are for sale and the funds made go to my coral reef research project and non profit to clean up Hanalei Bay. Surfing with no legs …and ripping! The World's Guide to Hawaiian Reef Fish ...proceeds support our work studying and monitoring the health of Kauai's reefs and waterways. 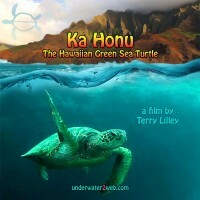 Terry is dedicated to the preservation of Hawai'i's coral reefs, protection of native species, supporting restoration of watershed and marine eco-systems for sea life and humans, marine-based education, and community-based environmental programs.